This book tells the story of the process leading up to the demolition of a small council estate in the north of England and its subsequent regeneration. 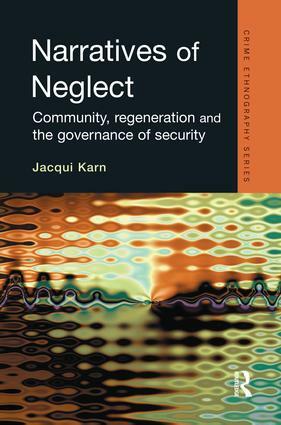 Based on extensive ethnographic research, it addresses the local governance of security and the ways in which the community engaged with attempts to improve the 'quality of life' of its residents and to attract wealthier new residents in the future. It explores in particular the meaning of notions of 'social capital' and 'partnerships' which often take little account of local power dynamics, seeking rather to find ways of mobilizing popular support for enforcement and exclusion rather than drawing on local knowledge of problems. In following the process of consultation with residents this book explores the levels of miscommunication across social divides, and the differing narratives of change produced by residents and professionals. Residents' narratives display an important interplay between constitution of identity, community, sense of security, attribution of blame and ascription of responsibility for dealing with local problems explored in this book through detailed analysis of case studies. In the final section of the book the author puts forward an alternative vision for participatory urban governance, bringing together notions of justice, rights, inclusion and sustainability.